Looking for something fresh and new for your next Christmas event or holiday tea? Contagious Christmas is exactly what you need! With Contagious Christmas, you’ll breathe new life into your holiday gathering. This event is centered on spreading the joy of Christmas. Women will enjoy getting to know one another as they share their own stories and connect with the story that started us all on a mission to make joy contagious—the Christmas story. The kit includes: Contagious Christmas Leader Guide—Your plan for guiding women through the experience. Also includes planning tips, a supply list, simple decorating ideas, recipe suggestions, and a Bible-based devotion for the event. 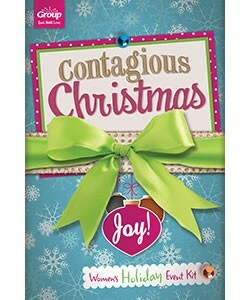 Contagious Christmas DVD—Tells the stories of people who have made sharing Christmas joy contagious. Used during the devotion portion of the event. Downloadable Graphics—A link to these graphics contains all the reproducible items you’ll need. These can be easily printed and used to make your event top-notch. Includes name tags, invitations, and other promotional items. 10-pack of the Contagious Christmas Memory Booklet—This memory booklet serves as a guide for each woman during the event and is a beautiful keepsake they can take home. If you’ll have more than 10 women coming to your event, be sure to pick up an extra pack—or two or three!